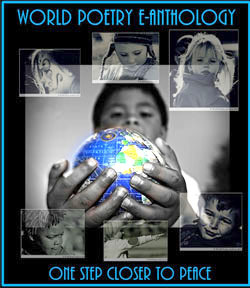 World Poetry Celebrates Forest Movie and a poem! World Poetry Media had the opportunity to view a very different film on October 9, 2017 during the Vancouver International Film Festival. It took the audience deep into themselves as well as giving stress relief. For me , it reminded me of another forest on Saturna, an old growth forest that we had visited years ago. First we passed a small plane that had crashed and that locals had been searching for in deep bush. The pilot and passenger had walked away from the crash safely. Then, suddenly we were in an deep forest that felt ancient and strange, not hostile but totally different from any other forest, I had been in. It had its own being and did not welcome intruders. Ancient forest, holding the beginnings of time. We venture in, lost, looking for a way out. Deep, damp darkness, the smell of many decades. Grass and moss caress your roots. You rein supreme, masters of all you see. To the ancientness of this place. You are the keepers of this place. We walk lightly, leaving soft imprints behind. We go softly, whispering into the light. Leaving the sacred balance of this place. A young woman (Ana Escorse) dreams of the forest. Upon waking she texts a friend, cancelling their day plans. Compelled to head into the woods, she follows her instincts, and finds that the deeper she moves into the forest the more it takes on a life of its own. Far from the noise of the city and alone with her own thoughts, she falls asleep and loses track of time. When she awakes, her surroundings take on a strange new quality. She’ll find that the journey home isn’t as easy as she expected. Matthew Taylor Blais Forest Movie is hypnotic and deceptively simple, graced with striking cinematography that alternates between fluid mobility and deathly stillness. The film plays like a call to break out of your routines, to embrace nature, to slow down and pay attention. But it’s also about asserting selfhood, about what happens when you finally face yourself and your thoughts head on, about the challenge of looking into the unknown. 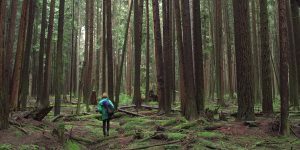 Immersing you in Vancouver’s beautiful Pacific Spirit Regional Park, this is an invitation to take a walk through the woods and through your mind. World premiere Director Matthew Taylor Blais , Country of Origin: Canada, Year: 2017,Running Time: 65 minutes. This entry was posted in General and tagged Ana Escorse, Director Matthew Taylor Blais, Gary Chutai, Haya Kailani, https://mubi.com/films/forest-movie, International Peace Award Ariadne Sawyer, Manny Mahal, Sital Cinema, The Forest, VIFF, Will Robson on October 24, 2017 by Ariadne.